The pyroxenes (commonly abbreviated to Px) are a group of important rock-forming inosilicate minerals found in many igneous and metamorphic rocks. Pyroxenes have the general formula XY(Si,Al)2O6 where X represents calcium, sodium, iron (II) or magnesium and more rarely zinc, manganese or lithium and Y represents ions of smaller size, such as chromium, aluminium, iron (III), magnesium, cobalt, manganese, scandium, titanium, vanadium or even iron (II). Although aluminium substitutes extensively for silicon in silicates such as feldspars and amphiboles, the substitution occurs only to a limited extent in most pyroxenes. They share a common structure consisting of single chains of silica tetrahedra. Pyroxenes that crystallize in the monoclinic system are known as clinopyroxenes and those that cystallize in the orthorhombic system are known as orthopyroxenes. A mineral is, broadly speaking, a solid chemical compound that occurs naturally in pure form. A rock may consist of a single mineral, or may be an aggregate of two or more different minerals, spacially segregated into distinct phases. Compounds that occur only in living beings are usually excluded, but some minerals are often biogenic and/or are organic compounds in the sense of chemistry. Moreover, living beings often synthesize inorganic minerals that also occur in rocks. Igneous rock, or magmatic rock, is one of the three main rock types, the others being sedimentary and metamorphic. Igneous rock is formed through the cooling and solidification of magma or lava. The magma can be derived from partial melts of existing rocks in either a planet's mantle or crust. Typically, the melting is caused by one or more of three processes: an increase in temperature, a decrease in pressure, or a change in composition. Solidification into rock occurs either below the surface as intrusive rocks or on the surface as extrusive rocks. Igneous rock may form with crystallization to form granular, crystalline rocks, or without crystallization to form natural glasses. Igneous rocks occur in a wide range of geological settings: shields, platforms, orogens, basins, large igneous provinces, extended crust and oceanic crust. Metamorphic rocks arise from the transformation of existing rock types, in a process called metamorphism, which means "change in form". The original rock (protolith) is subjected to heat and pressure, causing profound physical or chemical change. The protolith may be a sedimentary, igneous, or existing metamorphic rock. The name pyroxene is derived from the Ancient Greek words for fire (πυρ) and stranger (ξένος). Pyroxenes were so named because of their presence in volcanic lavas, where they are sometimes seen as crystals embedded in volcanic glass; it was assumed they were impurities in the glass, hence the name "fire strangers". However, they are simply early-forming minerals that crystallized before the lava erupted. Glass is a non-crystalline, amorphous solid that is often transparent and has widespread practical, technological, and decorative uses in, for example, window panes, tableware, and optoelectronics. The most familiar, and historically the oldest, types of manufactured glass are "silicate glasses" based on the chemical compound silica (silicon dioxide, or quartz), the primary constituent of sand. The term glass, in popular usage, is often used to refer only to this type of material, which is familiar from use as window glass and in glass bottles. Of the many silica-based glasses that exist, ordinary glazing and container glass is formed from a specific type called soda-lime glass, composed of approximately 75% silicon dioxide (SiO2), sodium oxide (Na2O) from sodium carbonate (Na2CO3), calcium oxide (CaO), also called lime, and several minor additives. The upper mantle of Earth is composed mainly of olivine and pyroxene. Pyroxene and feldspar are the major minerals in basalt and gabbro. A mantle is a layer inside a planetary body bounded below by a core and above by a crust. Mantles are made of rock or ices, and are generally the largest and most massive layer of the planetary body. Mantles are characteristic of planetary bodies that have undergone differentiation by density. All terrestrial planets, a number of asteroids, and some planetary moons have mantles. The mineral olivine is a magnesium iron silicate with the formula (Mg2+, Fe2+)2SiO4. Thus it is a type of nesosilicate or orthosilicate. It is a common mineral in Earth's subsurface but weathers quickly on the surface. Feldspars (KAlSi3O8 – NaAlSi3O8 – CaAl2Si2O8) are a group of rock-forming tectosilicate minerals that make up about 41% of the Earth's continental crust by weight. Figure 2: The nomenclature of the calcium, magnesium, iron pyroxenes. The chain silicate structure of the pyroxenes offers much flexibility in the incorporation of various cations and the names of the pyroxene minerals are primarily defined by their chemical composition. Pyroxene minerals are named according to the chemical species occupying the X (or M2) site, the Y (or M1) site, and the tetrahedral T site. Cations in Y (M1) site are closely bound to 6 oxygens in octahedral coordination. Cations in the X (M2) site can be coordinated with 6 to 8 oxygen atoms, depending on the cation size. Twenty mineral names are recognised by the International Mineralogical Association's Commission on New Minerals and Mineral Names and 105 previously used names have been discarded (Morimoto et al., 1989). A typical pyroxene has mostly silicon in the tetrahedral site and predominately ions with a charge of +2 in both the X and Y sites, giving the approximate formula XYT2O6. The names of the common calcium–iron–magnesium pyroxenes are defined in the 'pyroxene quadrilateral' shown in Figure 2. The enstatite-ferrosilite series ([Mg,Fe]SiO3) contain up to 5 mol.% calcium and exists in three polymorphs, orthorhombic orthoenstatite and protoenstatite and monoclinic clinoenstatite (and the ferrosilite equivalents). Increasing the calcium content prevents the formation of the orthorhombic phases and pigeonite ([Mg,Fe,Ca][Mg,Fe]Si2O6) only crystallises in the monoclinic system. There is not complete solid solution in calcium content and Mg-Fe-Ca pyroxenes with calcium contents between about 15 and 25 mol.% are not stable with respect to a pair of exolved crystals. This leads to a miscibility gap between pigeonite and augite compositions. There is an arbitrary separation between augite and the diopside-hedenbergite (CaMgSi2O6 –CaFeSi2O6) solid solution. The divide is taken at >45 mol.% Ca. As the calcium ion cannot occupy the Y site, pyroxenes with more than 50 mol.% calcium are not possible. A related mineral wollastonite has the formula of the hypothetical calcium end member but important structural differences mean that it is not grouped with the pyroxenes. Enstatite is a mineral; the magnesium endmember of the pyroxene silicate mineral series enstatite (MgSiO3) - ferrosilite (FeSiO3). The magnesium rich members of the solid solution series are common rock-forming minerals found in igneous and metamorphic rocks. The intermediate composition, (Mg,Fe)SiO3, has historically been known as hypersthene, although this name has been formally abandoned and replaced by orthopyroxene. When determined petrographically or chemically the composition is given as relative proportions of enstatite (En) and ferrosilite (Fs) (e.g., En80Fs20). Pigeonite is a mineral in the clinopyroxene subgroup of the pyroxene group. It has a general formula of (Ca,Mg,Fe)(Mg,Fe)Si2O6. The calcium cation fraction can vary from 5% to 25%, with iron and magnesium making up the rest of the cations. A miscibility gap is a region in a phase diagram for a mixture of components where the mixture exists as two or more phases – any region of composition of mixtures where the constituents are not completely miscible. Magnesium, calcium and iron are by no means the only cations that can occupy the X and Y sites in the pyroxene structure. A second important series of pyroxene minerals are the sodium-rich pyroxenes, corresponding to nomenclature shown in Figure 3. The inclusion of sodium, which has a charge of +1, into the pyroxene implies the need for a mechanism to make up the "missing" positive charge. In jadeite and aegirine this is added by the inclusion of a +3 cation (aluminium and iron(III) respectively) on the Y site. Sodium pyroxenes with more than 20 mol.% calcium, magnesium or iron(II) components are known as omphacite and aegirine-augite, with 80% or more of these components the pyroxene falls in the quadrilateral shown in Figure 2. Jadeite is a pyroxene mineral with composition NaAlSi2O6. It is monoclinic. It has a Mohs hardness of about 6.5 to 7.0 depending on the composition. The mineral is dense, with a specific gravity of about 3.4. Aegirine is a member of the clinopyroxene group of inosilicate minerals. Aegirine is the sodium endmember of the aegirine-augite series. Aegirine has the chemical formula NaFeSi2O6 in which the iron is present as Fe3+. In the aegirine-augite series the sodium is variably replaced by calcium with iron(II) and magnesium replacing the iron(III) to balance the charge. Aluminium also substitutes for the iron(III). It is also known as acmite, which is a fibrous, green-colored variety. Omphacite is a member of the pyroxene group of silicate minerals with formula: (Ca, Na)(Mg, Fe2+, Al)Si2O6. It is a variably deep to pale green or nearly colorless variety of pyroxene. Omphacite compositions are intermediate between calcium-rich augite and sodium-rich jadeite. It crystallizes in the monoclinic system with prismatic, typically twinned forms, though usually anhedral. Its space group (P2/n) is distinct from that of augite and jadeite (C2/c). It exhibits the typical near 90° pyroxene cleavage. It is brittle with specific gravity of 3.29 to 3.39 and a Mohs hardness of 5 to 6. Table 1 shows the wide range of other cations that can be accommodated in the pyroxene structure, and indicates the sites that they occupy. Coupled substitutions of 1+ and 3+ ions on the X and Y sites respectively. For example, Na and Al give the jadeite (NaAlSi2O6) composition. Coupled substitution of a 1+ ion on the X site and a mixture of equal numbers of 2+ and 4+ ions on the Y site. This leads to e.g. NaFe2+0.5Ti4+0.5Si2O6. The Tschermak substitution where a 3+ ion occupies the Y site and a T site leading to e.g. CaAlAlSiO6. In nature, more than one substitution may be found in the same mineral. 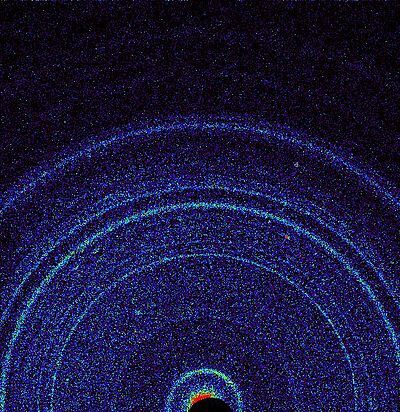 First X-ray diffraction view of Martian soil - CheMin analysis reveals feldspar, pyroxenes, olivine and more (Curiosity rover at "Rocknest", October 17, 2012). Hornblende is a complex inosilicate series of minerals. It is not a recognized mineral in its own right, but the name is used as a general or field term, to refer to a dark amphibole. 4 tetrahedra, linked at the vertices and generally containing ions of iron and/or magnesium in their structures. Amphiboles can be green, black, colorless, white, yellow, blue, or brown. The International Mineralogical Association currently classifies amphiboles as a mineral supergroup, within which are two groups and several subgroups. Augite is a common rock-forming pyroxene mineral with formula (Ca,Na)(Mg,Fe,Al,Ti)(Si,Al)2O6. The crystals are monoclinic and prismatic. Augite has two prominent cleavages, meeting at angles near 90 degrees. Forsterite (Mg2SiO4; commonly abbreviated as Fo; also known as white olivine) is the magnesium-rich end-member of the olivine solid solution series. It is isomorphous with the iron-rich end-member, fayalite. Forsterite crystallizes in the orthorhombic system (space group Pbnm) with cell parameters a 4.75 Å (0.475 nm), b 10.20 Å (1.020 nm) and c 5.98 Å (0.598 nm). Diopside is a monoclinic pyroxene mineral with composition MgCaSi2O6. It forms complete solid solution series with hedenbergite (FeCaSi2O6) and augite, and partial solid solutions with orthopyroxene and pigeonite. It forms variably colored, but typically dull green crystals in the monoclinic prismatic class. It has two distinct prismatic cleavages at 87 and 93° typical of the pyroxene series. It has a Mohs hardness of six, a Vickers hardness of 7.7 GPa at a load of 0.98 N, and a specific gravity of 3.25 to 3.55. It is transparent to translucent with indices of refraction of nα=1.663–1.699, nβ=1.671–1.705, and nγ=1.693–1.728. The optic angle is 58° to 63°. Silicate minerals are rock-forming minerals with predominantly silicate anions. They are the largest and most important class of rock-forming minerals and make up approximately 90 percent of the Earth's crust. Cummingtonite is a metamorphic amphibole with the chemical composition (Mg,Fe2+)2(Mg,Fe2+)5Si8O22(OH)2, magnesium iron silicate hydroxide. Hauyne, haüyne, hauynite or haüynite is a tectosilicate mineral with sulfate, with endmember formula Na3Ca(Si3Al3)O12(SO4). As much as 5 wt % K2O may be present, and also H2O and Cl. It is a feldspathoid and a member of the sodalite group. Hauyne was first described in 1807 from samples discovered in Vesuvian lavas in Monte Somma, Italy, and was named in 1807 by Brunn-Neergard for the French crystallographer René Just Haüy (1743–1822). It is sometimes used as a gemstone. Clinozoisite is a complex calcium aluminium sorosilicate mineral with formula: Ca2Al3(Si2O7)(SiO4)O(OH). It forms a continuous solid solution series with epidote by substitution of iron(III) in the aluminium (m3 site) and is also called aluminium epidote. Melilite refers to a mineral of the melilite group. Minerals of the group are solid solutions of several endmembers, the most important of which are gehlenite and åkermanite. A generalized formula for common melilite is (Ca,Na)2(Al,Mg,Fe2+)[(Al,Si)SiO7]. Discovered in 1793 near Rome, it has a yellowish, greenish-brown color. The name derives from the Greek words meli (μέλι) "honey" and lithos (λίθους) "stone". The endmember hornblende tschermakite (☐Ca2(Mg3Al2)(Si6Al2)O22(OH)2) is a calcium rich monoclinic amphibole mineral. It is frequently synthesized along with its ternary solid solution series members tremolite and cummingtonite so that the thermodynamic properties of its assemblage can be applied to solving other solid solution series from a variety of amphibole minerals. The mineralogy of Mars is the chemical composition of rocks and soil that encompass the surface of Mars. Various orbital crafts have used spectroscopic methods to identify the signature of some minerals. The planetary landers performed concrete chemical analysis of the soil in rocks to further identify and confirm the presence of other minerals. The only samples of Martian rocks that are on Earth are in the form of meteorites. The elemental and atmospheric composition along with planetary conditions is essential in knowing what minerals can be formed from these base parts. Ferrogedrite is an amphibole mineral with the complex chemical formula of ☐Fe2+2(Fe2+3Al2)(Si6Al2)O22(OH)2. It is sodium and calcium poor, making it part of the magnesium-iron-manganese-lithium amphibole subgroup. Defined as less than 1.00 apfu (atoms per formula unit) of Na + Ca and consisting of greater than 1.00 apfu of (Mg, Fe2+, Mn2+, Li) separating it from the calcic-sodic amphiboles. It is related to anthophyllite amphibole and gedrite through coupled substitution of (Al, Fe3+) for (Mg, Fe2+, Mn) and Al for Si. and determined by the content of silicon in the standard cell. ↑ Brown, Dwayne (October 30, 2012). "NASA Rover's First Soil Studies Help Fingerprint Martian Minerals". NASA . Retrieved October 31, 2012. C.Michael Hogan. 2010. Calcium. eds. A.Jorgensen, C.Cleveland. Encyclopedia of Earth. National Council for Science and the Environment.